But I was too much in love with this idea to just let it go. So I did what I do best . . . I changed it up to fit the needs of my classroom. (What I would later find out is just what the creators of Zoom-In wanted me to do.) 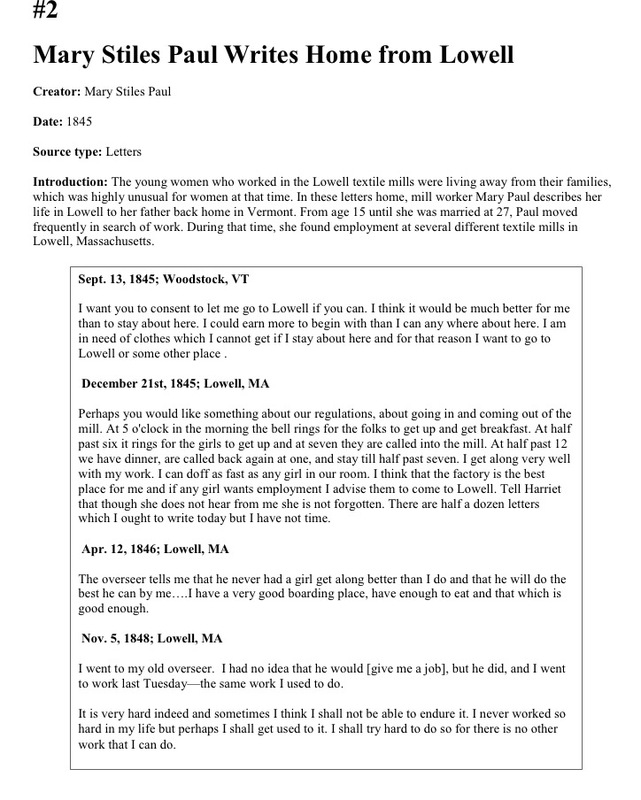 For this post I will be detailing what I did with the Zoom-In lesson over Lowell Mill Girls. I will also provide a link to a Google Doc that has everything I did to make this paper/pencil or iPad friendly lesson. 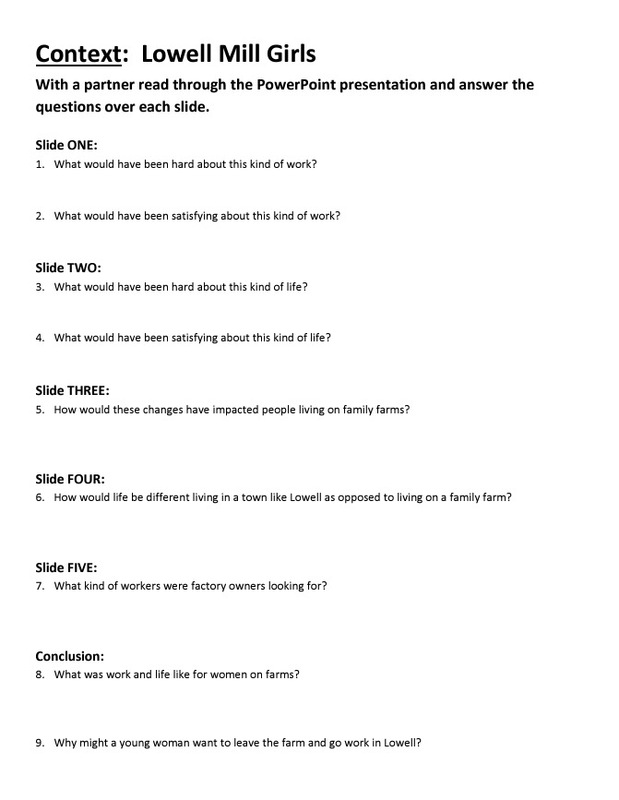 Lowell Mill Girls: This is the first Zoom-In on History lesson we will do for the year, so I will spend more time going through each of the different sections listed. Eventually we are able to get to where I only participate in the discussions and they are able to do the rest independently. Students are placed in “Zoom-In” teams and given a folder which has all the materials they will need for this unit (a bunch of work to set up ahead of time, but saves valuable time later). In their teams, students read and discuss the two quotes mentioned on this page. 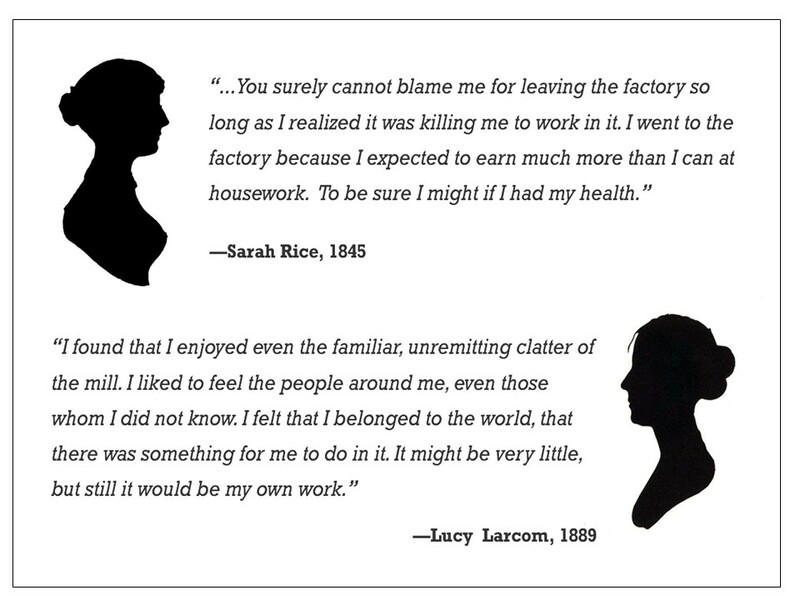 We discuss the differences in the two opinions of working in the mills, identify any vocabulary we don’t understand and start to see that there were some very different view about the opportunities for women and the hardships they encountered. Setting up some background information. I converted the activity from the website into a PowerPoint which share with the students. They go through with their teams reading the slide, answering questions, and are prepared to discuss with the class. **I do not read the slides to them. This is done in their teams. *** We then go through what they came up with on their slides and make sure they all understand. Again, these are taken directly from the Zoom-In website. I copied the documents and sourcing information into a Word document and then saved it as a PDF. This allows my students to be able to open it in various apps on their iPads so they can highlight important information in the text to use later. Students work in their teams to complete the document analysis form. 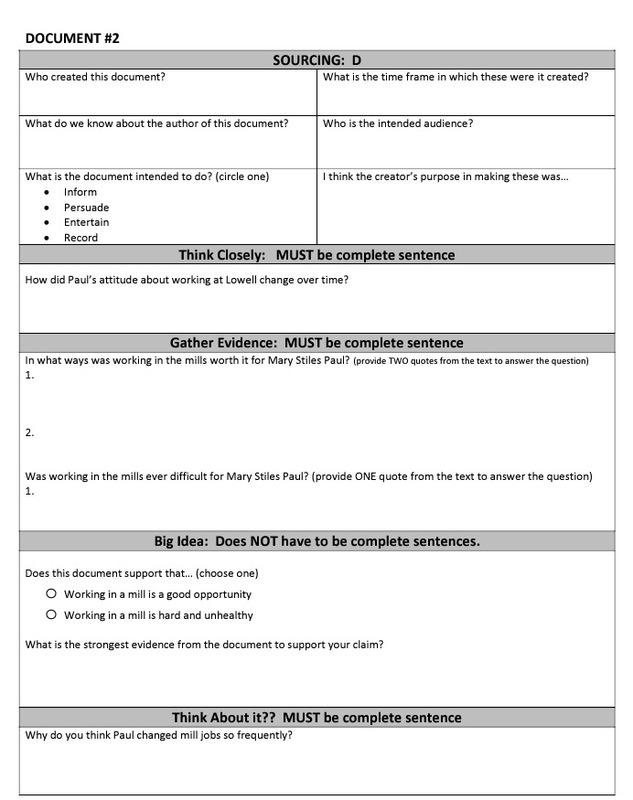 **This may seem like tedious worksheets, but it does help them to understand the document and start to pull out important details that will be used later to help form their opinion and in their written response. During this time I take specific questions that I want to go over, and use the teacher manual that comes with each Zoom-In lesson on their site. (Seriously…they have created such an awesome resource for teachers to instruct historical thinking). We usually play some sort of Kagan game in order to make sure students have grasped the concepts of each document and the context of the time period. My favorite is Numbered Heads Together. I don’t want this to take too long, just a quick over-view before they begin working on their own. **Up until this time kids have been working in their Zoom-In teams. I don’t do much in the area of grading for the first three exercizes. That was all team work, discussed in class, and not something I want to spend hours upon hours grading. I usually take some sort of “completion” grade. The bigger scores come next (and are worth my time grading) because the next activities are done individually. This is where they prove to me what they know and can do. 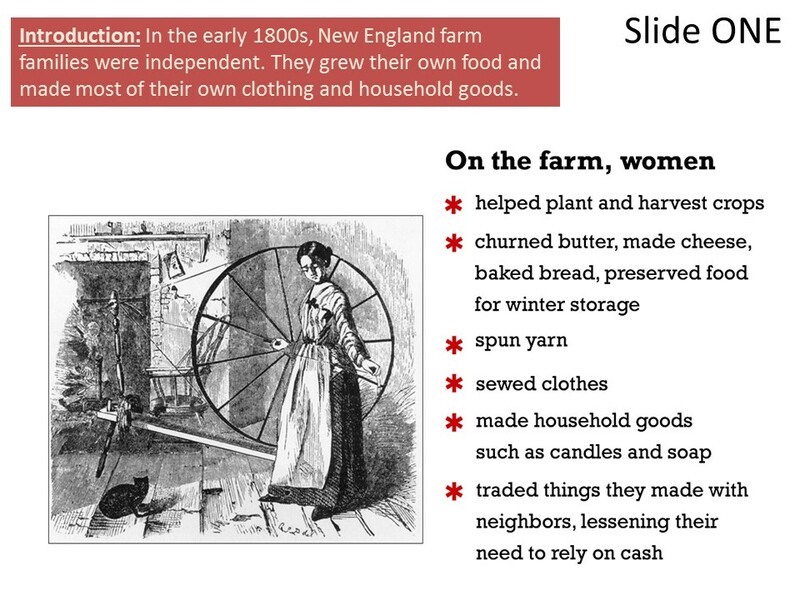 Here the students start to organize all the information they have learned about life as a Lowell Mill girl. This “sets the stage” for their written response, which comes next. Students now answer the essential question in written form. The website actually walks them through step-by-step how to write a 3-5 paragraph essay, depending on the type of essential question. Unfortunately, I just don’t have the time for that in class, so my students usually need to respond with one or two paragraphs. 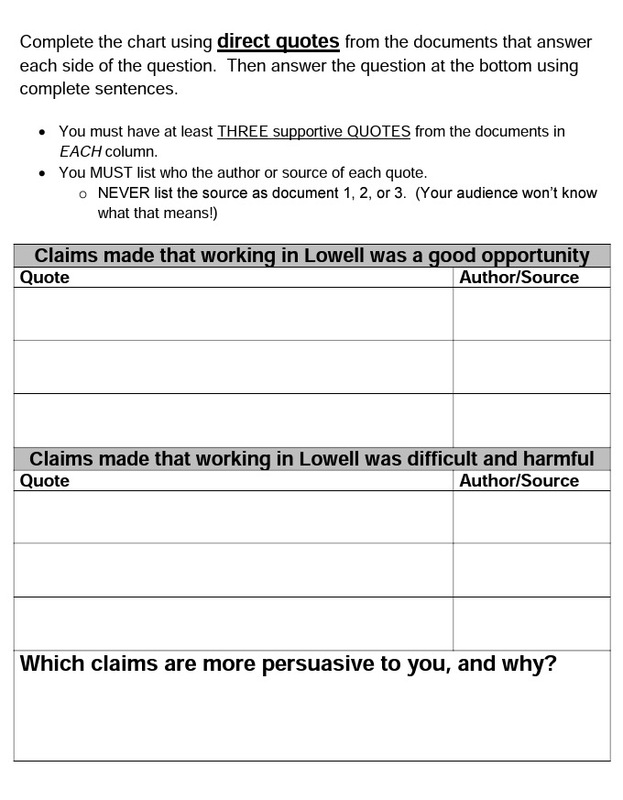 I always have a rubric for them to use (and to make grading SO MUCH EASIER). And there you have it. The first “Zoom In on History” lesson that I do with my 8th graders for the year. We will do 3-5 more depending on time available within the year. I have modified five of the lessons from the website to this version. I don’t always require a “written response” to answer the essential question. Sometimes we do an interactive game such as Cut-Throat History or History Chef, or we might do some sort of technology integrated presentation. Want more? Contact me via Twitter @JillWebs.